Module based on: NE555 chip. Main Chip (NE555) Characteristics This is a 12V Conduction delay relay module. Delay modue:delay connect module. - The output can be connected to AC 250V 10A or DC 30V 10A load;. 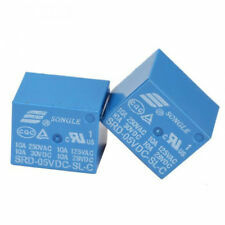 10pcs SRD-5VDC-SL-C Relay. Mounting form: PCB. Rated load: 10A 250VAC/28VDC,10A 125VAC/28VDC,10A 125VAC/28VDC. Insulation resistance: >=100M (ohm). Coil power: 0.36W, 0.45W. Product information. High current load (250V AC 10A or 30V DC 10A). Signal input optocoupler isolation, anti-interference ability. Modules can be triggered using the normally open type switch or a sensor. Canada, United Kingdom, Austrilia, France, Germany, Spain, Ireland, Italy, Others. Model: LY2NJ (8 pins). 1 x Coil Power Relay LY2NJ. Coil Power: DC (W): ≤0.9AC (VA): ≤1.2. Insulation resistance: ≤100 (mΩ). 1 x Sockets Base. Communication: WIFI (module ESP8266). This wireless relay is based on the AI-Thinker ESP-01S WIFI module. Support the source code of APP and LUA. Detail Image. Easy to use. Long service life. Support for the Arduino IDE 1.0 (OSX/Win/Linux). 6 I/O Pins (2 are used for USB only if your program actively communicates over USB, otherwise you can use all 6 even if you are programming via USB). This is a bistable (self-locking) relay module,Trigger once, the relay pull (and holds);Trigger again, the relay releases (and holds). USE : By default, the relay is release, press the trigger button, the relay pull, press again, the relay release, the third press, the relay pull, and so on. Model HK19F. 8 pins, DPDT type, PCB mount. Color Yellow. Product information. Number of Pins 8. Falling edge - triggered. Initial state after power no voltage output, once triggered, output terminal output the power supply votage, after once again trigger the output terminal no voltaged output, and so on. Low standby power consumption, high output power. Electrical parameters： Power supply voltage:DC 2.5V-6V Standby current:less than 10uA Driver IC is Dual P-channel MOSFET MEM2313,Maximum drive current is 6A Allowing continuous output current: 5A(5V-6V) 4A(3.7V-5V) 2A(2.5V-3.7V) Pin pitch 2.54mm. Size: 15mm x 13mm x 2.5mm. Weight : 0.5g(no Pin). (Arduino, 8051, AVR, PIC, DSP, ARM, ARM, MSP430, TTL logic). 1PCS 5V 2 Channel Relay Module For PIC AVR DSP ARM Arduino. (8051, AVR, PIC, DSP, ARM, ARM, MSP430, TTL logic). This is a 2 Channel 5V Relay interface board. To achieve fast turn-on and off the circuit, an unlimited number of switching;. P1.3: Signal trigger again, relay off, stop the clock;. P-4: signal holding function. 3: Output capacity: DC 5V - 36V, at room temperature, continuous current 15A, power 400W! Rated current: 40A. 1X Relay Socket. Relay harness length: approx. 12 Volt 30/40 amp 4-prong relays. and sockets are used for many car electronic applications to turn. Currents property: DC. amperage such as car alarms, remote starts, fog lights, stereos, fans. 3: output capacity: DC DC 5V - 36V, at room temperature, continuous current 15A, power 400W! Lower auxiliary. DC power, you can access the PWM signal, the signal frequency 0--20KHZ perfect support. Module Highlights. 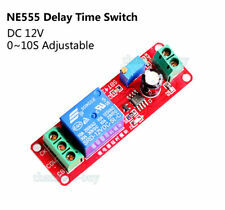 1PC 12V Bond Bistable Relay Module Car Modification Switch Start Stop Self-Locking. The secondary output end of the relay to withstand the maximum current is 10A, that is the maximum working current cannot. MCU watchdog circuit and special reset chip. The module Power-on, When triggered the relay is switched on, delay T1, and the relay disconneted. The module Power-on, When triggered the relay is switched on, delay T1,and the relay is disconneted, delay T2. 1 Channel Latching Relay Module 12V. Press the trigger button, the relay is locked, press again, the relay off, you can also add the trigger switch, and the use of low-level trigger. 1x 1 Channel Self-locking Relay Module 12V. Module based on: NE555 chip. Main Chip (NE555) Characteristics This is a 12V Conduction delay relay module. 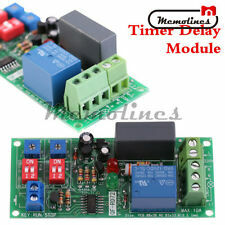 Delay modue:delay connect module. 10A, DC 0~30V / max. Simple circuit design. - The output can be connected to AC 250V 10A DC 30V 10A. Specification: Item No: SSR-40DA Input voltage: 3-32V DC Output voltage: 24-380V AC Output current: 40A Working voltage: 250V On voltage: ≤1V One-off Time: ≤10ms Off leakage current: ≤2mA Material: plastic metal Color: as picture shows Size: approx 60*45*23mm Package included: 1pc x Solid state relay Brand Unbranded Model SSR-40DA UPC Does not apply MPN Does Not Apply MPN Does Not Apply. 1 xSolid State Relay. Insulation Resistance:500MΩ/500VDC. Dielectric Strength:2000VAC. This is a bistable (self-locking) relay module,Trigger once, the relay pull (and holds);Trigger again, the relay releases (and holds). Working current: 1 relay 37MA;2 relay 73 MA; 3 relay 1 10MA; 4 relay 146 MA. Output current: 25A. 1pc x Solid state relay. Canada, United Kingdom, Austrilia, France, Germany, Spain, Ireland, Italy, Others. USA, Canada, United Kingdom, Austrilia, France, Germany, Spain, Ireland, Italy, Others. Relay Specifications:AC 220V 10A or DC 30V 10A. Short press K1. seconds after,there lay open Y seconds,then close.Users can set the relay. bit digital tube starts flashing, then press K3, single-digit change;then. The red indicator is lighted on during charging process. This module is not output without connect with a battery because it has the function of reverse connect protection.